I assure you: unless a grain of wheat falls to the ground and dies, it remains by itself – but if it dies, it produces a large crop. I am sure all true believers in Christ want to come into vital relationship with God. I am sure all born-again Christians long to know the fullness of Christ’s life within. I am sure many in the church of Christ long to be effective in their service to Him, but fullness of life and service in the inner man is birthed from Christ’s imputed life.. and for believers to live in newness of life in Christ – He first must die on the cross. First his self-life must remain crucified on the cross of Christ – until He lives in me. Being made in the image of God means we are made up of spirit, soul and body. The inner spirit of man is the part of our being that communes with God. The old sin nature of the old life in Adam must die, so that Christ’s new life can live. I assure you: unless a grain of wheat falls to the ground and dies, it remains by itself – but if it dies, it produces a large crop. The church of Christ is not an organisation but an organism… a living thing and the church of Christ is made up of many members… who are all in Christ, – and like all living things the church is not an end in itself but points to a larger end. The church is a vessel that is used by God for His deeper, wider and eternal purposes. The church is a channel thru whom God currently works – to achieve His will. The church is a living body that is in functional relationship with Jesus – her Head. The church is being used to reproduce – to bear fruit and to yield up its increase. Individually and corporately the church is an organism that is to grow and multiply, but like every living thing, reproduction is sacrificial. Unless a grain of wheat falls to the ground and dies, it remains by itself. But if it dies, it produces a large crop and a lot of grain. God’s law of increase is first, sacrifice – God’s law of life is first, death. A grain of wheat that remains unplanted remains one single granule of wheat. An unsown kernel of corn will not propagate nor will it have any increase. The Lord Jesus Christ shows us the nub of this principle within His own godly life. He was the first single and singular seed of wheat to fall into the ground and die, for without His death there would have been no resurrection of the dead – and without His resurrection there would be no newness of life for you or me. The risen life of Christ is to be the inner experience of all that are born from above. The resurrected life of Jesus is to be the vital expression of the Christian’s new life. Because Christ rose from the dead His risen life is imparted to all who trust in Him – the fruit of Christ’s death and resurrection is manifested in the life of all believers. We should all desire to know Christ’s resurrection power in our own life, for because He died we too have life, eternal life – HIS life more abundantly. But the path to the cross was strewn with suffering and sadness – pain and sorrow.. but unless a grain of wheat falls to the ground and dies, it remains alone – but because Christ died, His resurrection-life has produced heavenly abundance. The risen life of the Lord Jesus is to be the same risen life indwelling each of us.. living a life in submission to the Spirit – a life that says, Thy will not mine be done. The life of Christ in the believer is to be a reproduction of the life He Himself lived – a life that walked in spirit and truth – a life that learned obedience thru suffering. 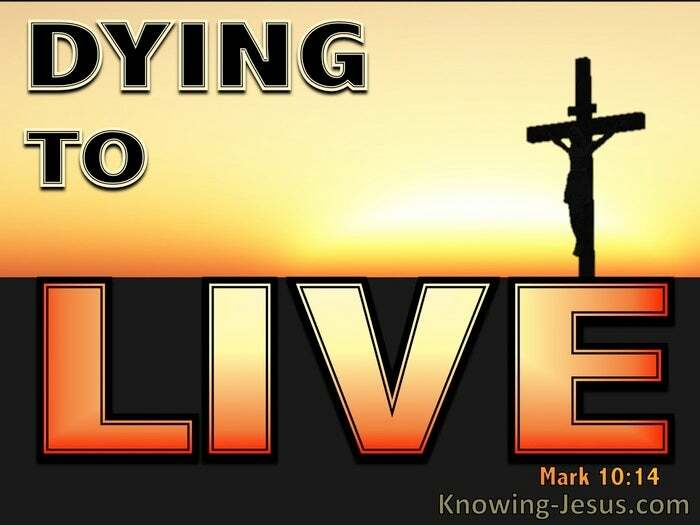 The death that He died was the catalyst for the life that we live – in Him: for we know that our old self was crucified with Him.. so that the body ruled by sin might be done away with – that we should no longer be slaves to sin. 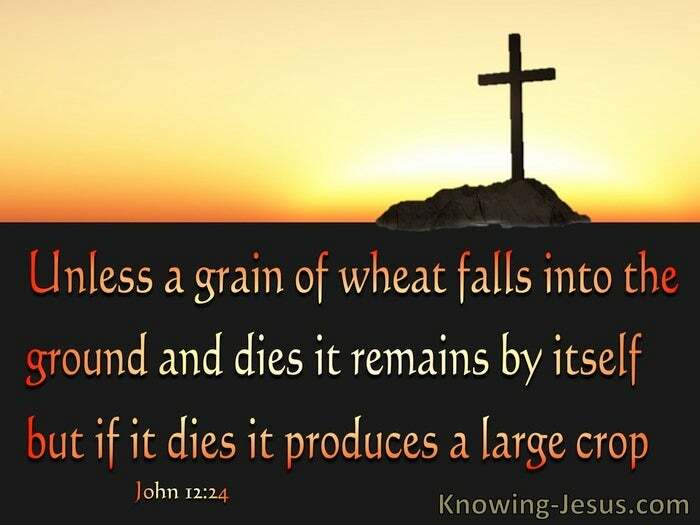 We have been raised to newness of life thru the death and resurrection of Christ, and the law of reproduction dictates that we too must fall into the ground and die: for unless a grain of wheat falls to the ground and dies, it remains by itself but if it dies, it produces a large crop.